Greek origins; meaning "violet flower"; also the name of an ocean nymph. Scent: Lavender, honey, parchment, champagne. Ianthe positively exudes an air of sinuous beauty, all neatly coiled muscle and tendon wrapped beneath an attractive outer covering. She displays all the classically beautiful traits, including the elegant, arched neck, a delicately carved face, and a curvy, willowy body frame that belies the strength and endurance within. Most souls are initially drawn in by how feminine Ianthe's body is - full of supple, eye-catching curves to entice one's senses. Overall a graceful physique, it is coupled with an impressive aesthetic appeal, with a soft lilac hued coat with touches of white markings to compliment. Ianthe is crowned by sleek silken lilac tresses that brush along the ground and gently across her shoulders. Buns are twisted into her thick, voluminous mane to sweep some of Ianthe's hair off of her slender neck. Ianthe's long, slender legs end in delicate hooves. 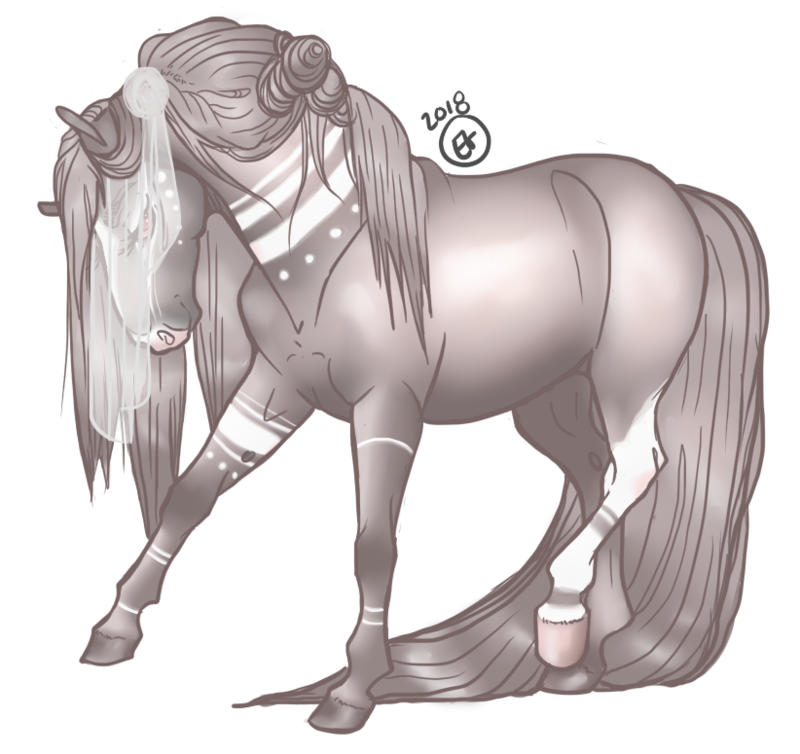 Three of Ianthe's hooves are a shade of lilac slightly darker than her body, while her back left hoof is a soft pink. White markings break up the lilac monotony of Ianthe's coat in crisp lines and dots along her neck, legs, and face. Single tall white stocking encases Ianthe's rear left leg, while a thick strip of white runs down her gentle face. Ianthe's nose is white, causing the skin of her nose that shows to be pink. Her radiant facial features are completed with glimmering, intelligent eyes, colored a soft, yet rich rose pink. On almost all occasions, Ianthe is seen veiled. A thin, gauzy veil obstruct's Ianthe's beautiful face from public view and is held tight by one of the many buns in Ianthe's mane. One would be hard-pressed to deny the lilac lady in all her splendor. At first glance, some would find Ianthe to be a quiet mare. She is an observer and thinks before speaking. Ianthe hardly ever raises her voice above a gentle lilt, even when greatly enraged. Ianthe chooses her words wisely, knowing carelessness can inflict lasting damage. She knows her place in the aristocracy of the world and understands what's to be expected of her - but that doesn't mean she is a meek, submissive mare by any means. With the disposition of a saint, it takes a lot to get Ianthe to the point she would become angered at another. Ianthe is practically impossible to rile up or agitate, but that does not mean she's a push-over. This quiet, soft-spoken lady stands her ground without ever raising her voice. Sweet, loving, and with the disposition of an angel, it's hard not to like Ianthe, or at least marvel at how unbelievably kind and forgiving she can be. Anyone and everyone is greeted with optimism and guarded friendliness. In general, Ianthe does not question the motives of others without good reason, and while this tendency has caused plenty of trouble in the past, it has also won her many loving friends. She is sworn to gentleness and forgiveness and would give second chances even to those that others might think undeserving of that trust. In general, Ianthe is very selfless and is constantly looking for ways to help others without consideration of herself, almost to a fault. Some call it being noble, others call it stupid, while still others call it stupidly noble. In all other regards, it would be difficult to find a more lovable lady in the land. On top of her gentle disposition, Ianthe has a sharp wit and is rather intelligent – quick on her hooves and witty, charming just about anyone she meets. Perfection in goodwill and compassion, Ianthe loves to help others with their problems to the best of her abilities. But don't be fooled by her charm and grace; Ianthe, while not prone to anger quickly, she does not take slights against her loved ones well at all. Threatening or causing great harm to those Ianthe cares for is a guaranteed way to earn a spot on her very short list of those she dislikes, and it is not a list one wants to be on. Once upon a time some springs ago, Ianthe was born to nobility in the House of Ambrosius. Her parents were far enough removed from the sovereign family to be out of harm's way, but close enough to be comfortable in life. Her parents were young and in love, not long married when Ismene discovered she was with child. Both were pleased to have such a lovely, beautiful daughter to add to their smaller family - even if Lord Ajax had secretly wished for a son. Under the guidance of her mother, Ianthe grew into a society belle. There is not much to Ianthe's tale beyond growing up in a cushy, privileged lifestyle. Yet, the lilac lady often dreamed of a life beyond the metaphorical walls her parents had built around her. What was it like, beyond Ambrosius's borders? ...what was it like to have the power to decide your own fate? With a focused subset of biological manipulation, Ianthe can restore biotic organisms to their optimal health, curing damaged or withered organisms, wounds, broken bones, low vitality, and diseases/poisoning. Ianthe can manipulate healing and the healing process, speeding any or all aspects of healing to the point of regenerating, or slowing and blocking healing even if the victim possesses healing abilities. Though Ianthe may potentially heal any form of bodily damage, the patient must be alive, even if hanging by a thin thread, in order to be healed without expending too much of Ianthe's strength. Once the patient has died, it would require resurrection instead, which taps into energy Ianthe would rather not use. Ianthe expending too much energy will result in bloody noses, loss of consciousness, etc. Apprentice: Ianthe's healing abilities are weak yet still potent. Ianthe can heal herself to a certain degree as well as others by touching the injured creature in question. She can heal other minor injuries or ailments. Adept: While Ianthe cannot save lives quite yet, she can increase the speed in which a wound clots, if not stem the blood flow all together in order to buy someone the time to get into a safer location. Healing minor injuries does not tire her as easily anymore. She can inflict minor illnesses on others who have earned Ianthe's wrath. Master: At this stage, Ianthe can now mend broken bones, serious illnesses, and diseases with ease. Prolonged use may tire her, but will not incapacitate her. Blocking another's regenerative powers comes with ease, but requires some focus. Ianthe can also inflict more serious ailments and diseases upon others that have earned her ire; going so far as "activating" dormant diseases found in someone's biology. Virtuoso: Ianthe's general healing no longer has ramifications for herself or her energy. At this stage, Ianthe is capable of bringing the recently deceased back to life, but for a steep price. Resurrection draws significant energy from Ianthe, almost too much. Ianthe must be careful with how much energy she uses to coax someone from beyond the veil; if she uses too much energy, Ianthe pays the ultimate price. Otherwise, Ianthe is tapped completely of her energy resources for days and requires long amounts of rest to bounce back. 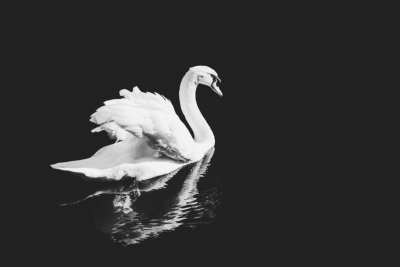 [ PHOEBUS ] A male Mute Swan of the most crisp, pure white one might ever see save for fresh virgin snow, Phoebus is the epitome of grace. A fitting companion for a refined lady, the water fowl is fiercely protective of his equine companion.